Hale Creek ASACTC is located in Johnstown New York, part of Fulton County. 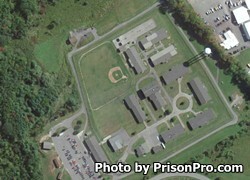 It is a medium security prison that specializes in substance abuse treatment. This facility has the capacity to house 480 adult males. Every inmate at this facility must partake in Phase I of the comprehensive alcohol and substance abuse treatment program. Hale Creek ASACTC has limited vocational courses, offering only custodial maintenance to select inmates. This facility specialized in substance abuse treatment and has a comprehensive treatment available to inmates. Additionally, a relapse treatment is available. Visiting is on Saturdays, Sundays and Holidays from 9am-3pm. Processing of visitors ends at 2:30pm. Inmates can have up to three adults and two children who are small enough to fit on a lap, visit at a time.